The One bedroom Deluxe luxury apartment offers spacious accommodation of 80 square metres. It’s a cozy unit for a maximum of two people with an open plan, modern kitchen, well fitted and equipped with crockery and cutlery. As well as a four burner electric cooker and full oven. Additionally, the unit is equipped with an electric kettle, toaster and microwave. Plus a sizeable fridge with separate ice compartment. The bedroom has a double bed, spacious Meru oak-wood wardrobe fittings with a shoe and tie rack and a safe. Earthy wooden floors that are meticulously maintained for an elegant and luxurious finish. The bathroom has a separate shower compartment and a luxurious ceramic bath tub. 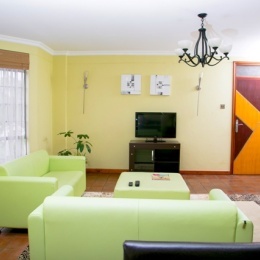 Each unit is equipped with a 40” plasma LG TV, DVD player, cable network, as well as complementary high speed internet. In the heart of Kilimani, Nairobi, Batians Peak Serviced Apartments offers the ultimate luxury in furnished and serviced apartments, located conveniently near major shopping malls, restaurants and movie theaters. For those doing business in town, you will not find a better location, close to the commercial city centre and Upper Hill’s financial hub. We have created a place that provides the comforts of home but the service of a hotel, providing the conveniences found in larger cities, while maintaining the quality of life and community found only in at home. Modern, spacious and comfortable one and two-bedroom apartments complete with fully equipped kitchens and free wireless Internet access.